When it comes to recording a guitar direct and treating it with amp modelers, there are of course options available. You can use a Universal Audio hardware interface and any number of their renowned amp modeling plugins. Or you can use any audio interface along with third-party modeling software like the Softube Vintage Amp Room. But Sono, a brand-new product from Audient, combines a recording interface with amp modeling and speaker simulations in one unit. The 20-year-old pro audio company Audient collaborated with modeling gurus Two Notes to bring amp and cab simulations from their Torpedo line of amp top units and stompboxes to the Sono. And the wealth of onboard features—which include a 12AX7 tube preamp—are sure to appeal to guitarists hoping to make great-sounding home recordings with ease. You can choose between a range of guitar and bass cabs, "based on classics such as the Marshall 4x12, Fender 2x12 or Ampeg Fridge, with more tones downloadable from Torpedo Remote if needed," says Audient's Andy Allen. "You can even customize everything from the room type, microphone model and placement too, and once you're happy with your sound, you can store your favorite presets on board Sono and play them in standalone mode at any time—without the need for a computer." The Sono features two line or XLR inputs, available with phantom power, two stereo audio outs, a USB-C connection, and separate outputs to use with headphones or your regular amp. Sono's monitor mix allows you to choose to listen to your guitar's input signal, playback from your DAW, or a mix between the two. You can also plug other pedals into the Sono to shape tones with your favorite stompboxes without the need for a traditional amp. Of course, there's no need to limit yourself to a guitar. 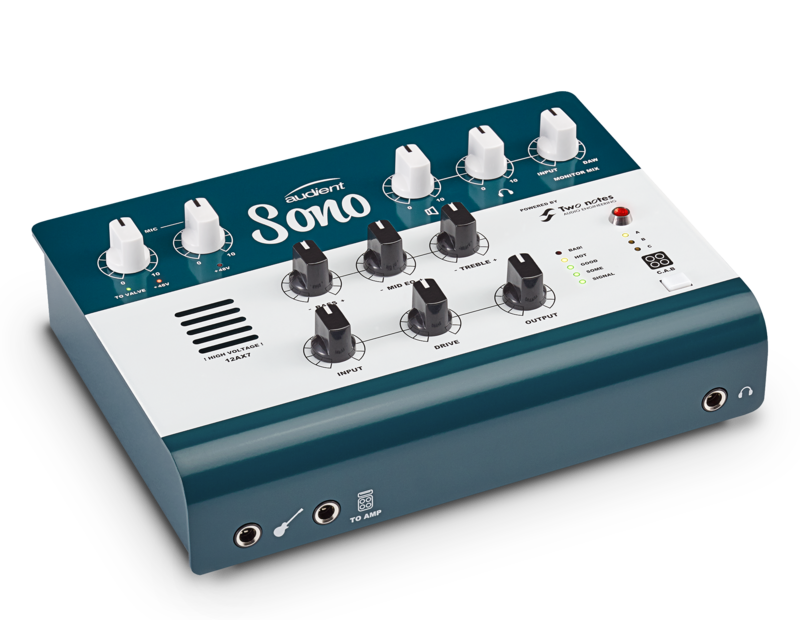 The Sono interface can just as well handle vocals, synths, or other instruments that you can either record direct, using only the tube preamp, or through the modeling options to bring saturation or other character to your sound. It's expected to ship in the first quarter of 2019, with a retail price of $449 USD. Be sure to check back soon for availability.